Two thirds of men with elevated PSA levels don't actually have the disease. It could mean they have an inflammation or infection of the prostate. Inflammation is often seen in samples of prostate tissue that also contain cancer. While the link between the two is not yet clear, this is currently being studied. Most Often, These Symptoms Are Not Due To cancer. It could be BPH-Benign Prostatic Hyperplasia, which is an infection of the prostate, or another health problem. If you are experiencing any of these symptoms, or an elevated PSA you should work with your doctor. What Are Some of the Risk Factors A Man Could Have? First of all having a risk factor doesn't mean that a man will develop prostate cancer. Most men who have risk factors never develop the disease. Researchers Say, Men From Families Where The Women Have High Rates Of Breast Cancer Could Have A Four Times Higher Risk Of Prostate Cancer. The Main Risk Factor Is Being Over Age 65 . Your risk is higher if your father, brother, or son had it. It is more common among black men than white or Hispanic men. It's also found less among Asian/Pacific Islander and American Indian/Alaska Native men. Researchers say veterans exposed to herbicides like Agent Orange may be at higher risk. Studies of Vietnam veterans provide evidence of the negative health effects of exposure to Agent Orange. 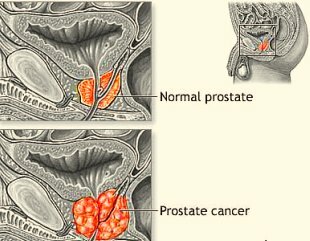 Men exposed to pesticides and herbicides in agricultural areas or industry may have a higher than average rate of prostate cancer. Researchers have studied whether vasectomy may pose a risk but most studies have found no indication of it. Many other possible risk factors are being studied. However Researchers Continue To Study These And Other Possible Cancer Risk Factors. However here is a finding that could be important. Obese Men Are More Likely To Die Of The Disease Than Men Of Normal Weight. Though No More Likely To Actually Develop The Disease. Studies show you can reduce your risk of prostate cancer by 63 percent? Here's What You Must Do. Increase their Omega 3 Fish Oil intake with a quality supplement. Fish oil contains Omega-3 fatty acids, EPA and DHA, believed to have great potential for both heart disease and cancer prevention. Reduce omega-6 intake by eliminating vegetable oils and the processed foods made with them. This could help stop cancer tumor growth and end the chronic inflammation that contributes to the disease. Use only butter, olive oil, or Pure Virgin Coconut Oil to decrease inflammation in your body. April issue of Clinical Cancer Research. The researchers found that men who had the highest intake of omega-3 fatty acids had a 63 percent lower risk of aggressive prostate cancer compared with men with the lowest intake of omega-3 fatty acids. Follow an inflammation free diet . Eat fresh fruits and vegetables, limit grains, and eliminate vegetable oils and margarine. Diet is one prevention measure that is under your control. That includes organic meat so you have no antibiotics remaining in the fatty tissue. Research suggests moderate doses of capsaicin makes 80 percent of prostate cancer cells die. Pass the chili peppers please, the hotter the better. Some studies have shown a 26 percent lower risk of prostate cancer by men who eat tomatoes regularly. That includes raw, cooked, or in tomato products such as tomato sauce, paste or ketchup. Studies have also found that five servings or more of fruit per day can cut the risk in half. Fruit helps because it stimulates the body's ability to create vitamin D, which is believed to reduce cancer risk. Men who eat plenty of broccoli and cabbage may reduce their risk. Three or more servings a day can reduce risk by as much as 41 percent. There is also a new early detection method being studied. In a recent study the gene screen "could be another test that helps to improve early prostate cancer detection," he says. Do you have potentially lethal cancer, or do you have cancer that will never kill you?" The fact is that many prostate tumors grow so slowly that many men are likely to die from other causes long before the tumor itself becomes deadly. Ross says the new test may be able to distinguish between slow and faster growing cancers, but that further testing is needed before that claim can be made. The study was supported in part by Source MDx, which developed the new test. U.S. national guidelines no longer recommend regular PSA screening for men over the age of 75. Younger men are advised to consult with their doctor. Men With The Highest Intake Of Vitamin k2 Have The Lowest Incidence Of Prostate Cancer.